The latest results are in from the great Oregon Health Insurance Experiment (OHIE). In a randomized experiment, individuals offered Medicaid coverage showedÂ higher rates of emergency department (ED) use than did their otherwise comparable peers not given the same opportunity. The effect size was pretty smallâ€”about one extra ED visit per recipient, every 3.5 years or so. In dollar terms, this amounts to an estimated annual expenditure increase of something like $120 per recipient. We canâ€™t say from this paper whether the extra ED visits were valuable or cost-effective. We can say that these results will embarrass some liberal advocates who argued that expanded coverage would reduce overall rates of ED use. They should. This talking point was never properly evidence-based or even particularly plausible given prior research. Itâ€™s not obvious that reducing the rate of ED use is even a sensible policy goal. Advocates across the political spectrum should stop using the ED for cheap talking points about the mythical savings associated with universal coverage or about the misbehavior of Medicaid recipients who supposedly waste huge amounts of money through overuse. We might, instead, take some satisfaction that we have created a system, open 24 hours per day, 365 days per year, which people turn to when they need help. Our challenge is to make this system work. The insurance companies could help by promoting the use of the clinics that are appearing in drug stores. I have used them even though I have a regular internist, usually because I could get in within a few hours instead of waiting until the next day. Yes, fortunately, I can get into my doctor’s office to see one of the PAs in 24 hours. But there are times when the flu / cold / ear infection hits and the delay would be bothersome. Similarly, insurance companies or proactive hospitals could encourage setting up a clinic in parallel with the ER. Triage at the front door: to the left for real emergencies and to the right for clinic care. Each would have the facilities and staff appropriate for their needs. The clinic perhaps would not operate the full 24 hours and people could be advised to come back when open. You have to believe that hospitals have already been thinking along these lines for a long time. Harold, what has kept them from implementing something like this? It would improve care for real emergencies, especially the ones that are not 100% apparent when the patient comes in the door. Is it fear of being first? liability? what? I went to an ED this summer in Oregon that had exactly that policy. I showed up with what I knew to be a need for urgent care, not an emergency (but I was on a bike and hundreds of miles from home). The hospital sent me off to a different part of the hospital than the (extremely unbusy) Emergency Department. or about the misbehavior of Medicaid recipients who supposedly waste huge amounts of money through overuse. Well, that is the basis of it â€“ turning around the R talking point that poor people use the ER a lot. That’s an R talking point? The only ones I’d heard it from were liberals who said that the uninsured use the ER a lot specifically because they had no insurance. So are we now going to see lots of finger-pointing over who claimed that universal coverage would reduce ED use? Harold — I wonder if people who have had insurance consistently through their lives would show this effect, or if this is what you get when people who are used to going to the ER get insurance after not generally having it. And I’d think that Massachusetts before and after Romneycare would be informative too. Usage was up across the board, not just of ERs, so it isn’t a case of people going to the ER because they’re used to doing so instead of calling a doctor. They used more of everything, which seems more consistent with a story about costs than habit. Thanks Megan that is helpful to know. Interestingly enough, Oregon has been taking steps in the five years since the Medicaid expansion to reduce ED visits for non-emergency care. They’re using Coordinated Care Organizations (like ACOs) to coordinate Medicaid delivery, and have had promising results so far in reducing expenses overall, including ED visits. Emergency-department spending decreased by 18 percent in Oregon’s Medicaid program, when the 2013 study period was compared to a 2011 benchmark. One interesting wrinkle is posting community health workers in the ED to steer patients to less costly care. Thinking in terms of anecdata, my mother-in-law is on Medicare with a good medigap policy and has made at least ten trips to the ED in the last five years, always for emergency care outside office hours, at least eight times by ambulance. (Usually brought on by skyrocketing blood pressure.) Would she use the ED less if she had no insurance? It’s hard to say, but I wouldn’t be surprised if she did use it less. But, it would be fear of being saddled with a huge bill that would have discouraged her. Unlike a lot of people (at least in the view of some conservatives), she actually doesn’t like to ride in ambulances and spend days in the hospital hooked up to IVs and getting poked and prodded while eating almost inedible food. I’ll even go out on a limb and say that if she doesn’t go to the ED at all this year, she’ll be happier than if she did. Could you expand on “itâ€™s not obvious that reducing the rate of ED use is even a sensible policy goal”? I would have thought that it was, simply because ED is an expensive way to provide care, and isn’t designed to do follow-up or condition management. Reducing the rate of ED use for chronic care problems (e.g., asthma, diabetes, hypertension) is very desirable. Reducing the use of EDs for real emergency-care needs is not desirable. It’s possible that the uninsured defer emergent problems they should get checked. It appears that the data used in this report (based on the Science blurb) can’t address this question. I agree. Without knowing the numbers for subsequent admissions and stays, just knowing the number of ER visits is going to be a crude metric at best. Yes. It would be interesting to know if the pattern of use has changed, or at least what problems the incremental users are showing up with. If we are seeing more use for legitimate emergencies, that’s not a bad thing. Even if we’re seeing more use for non-emergencies, it might be a good thing if that non-emergency use leads to fewer major admissions. We just don’t know without better data and analysis. A kid with intractable abdominal pain may have appendicitis, and it’s better to be safe than sorry. Getting stitched at an urgent care clinic is reasonable if one is open when you need it (and if they do suturing). Part of the problem is that non-medical professionals can’t reliably discern between emergent and non-emergent problems. This is why we have medical professionals. 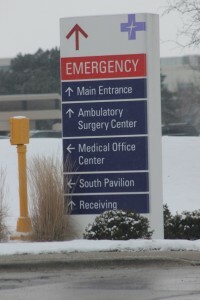 I agree–reducing the use of emergency rooms for real emergency care would be undesirable. I was thinking specifically of the rate of ED use as being driven mostly by non-emergency care–things like flare-ups of chronic conditions, persistent fever, and so on–where urgent care or a doctor’s office would provide better follow-up and cheaper care. “So I have a solution. And it will cost not one thin dime,” Mr. Goodman said. “The next president of the United States should sign an executive order requiring the Census Bureau to cease and desist from describing any American â€“ even illegal aliens â€“ as uninsured. Instead, the bureau should categorize people according to the likely source of payment should they need care. The problem with Goodman’s point is that ERs are not required to treat the condition. All the ER MUST do is keep the patient from dying, to put it rather bluntly and simply. That is not health care. Is it really ethical to carry out a controlled trial – with half the subjects not getting the service – on access to health insurance, a fundamental social right? The experimenters would have to be people who don’t see it that way. Otherwise, what’s the difference from Tuskegee? James: That is rather facile. The state had enough money to pay for some insurance expansion but not enough for everyone, so a research team studied what happened to those who got it. The researchers did not decide that health insurance isn’t a fundamental right – the voters did. Haroldâ€”do you think that this study illustrates a plausible concern about the ACA, namely that it insures more citizens but does not create the primary care infrastructure to implement it? There are a limited number of family practitioners and general internists whose practices may already be quite busy; delivering the care is something quite different from creating an insurance system to pay for it. In other words, the term Obamacare could be a misnomer in more ways than one. Perhaps it should have been called Obama-insurance, making it more clearer what the Act actually provides. Keithâ€™s link below to the Onion TED talk about having an idea and implementing it seems relevant here; it is one thing to create a way to pay for something and a very different thing to create the thing itself. But seriously, the persistent conflation of medical insurance (a financial service) with health care (medical services) has always annoyed me. Health care is provided, and gated, by physicians. It’s physicians who prescribe the tests and scans and drugs and prosthetics that can cure illness or repair injury or alleviate pain. Insurance companies merely move money around — and collect a percentage for doing so. During the Obamacare debates (a year of yakking that right-wingers keep pretending never happened) I was saying that Democrats ought to emphasize that the battle was about reforming health insurance, not health care, on the grounds that when people hear “health care” they think of their doctor, whereas when they hear “health insurance” they might think about their monthly bill. But I’m no PR expert, I guess. Reforming the health insurance system may well result in more people getting more health care. Good. Health care provision is just as much an economic activity as the provision of food, or energy, or entertainment — and a damn sight more useful than the provision of some “financial services”. Growing GDP means growing the “utilization” of something. Why is “health care” the one sector of the economy (aside from education) that conservatives are always against the growth of? Why is “over-utilization” a problem when it comes to “health care” but not to “housing” or “software”? 1. Are we sure that this isn’t cost effective over the longer term? 2. Are we sure that this isn’t a case where the costs might be higher for the government but lower than they would otherwise be? I seem to remember people saying that if Paul Ryan and others got their way, Medicare costs might go down for the government but that total health care costs for people on it would quite likely rise? 3. Isn’t cost control about more than potentially reduced ER visits? I agree that we’d need to know a lot more to interpret this. Perhaps people with insurance are more apt to exercise or try new activities, which can sometimes lead to injury along with greater long-term health. Uh…isn’t it a bit premature to come to any conclusions? Next Next post: Ever wonder what David Brooks sounded like when he gave that high school English presentation stoned?